Coverage: Afternoon sessions (14:00 GMT) and first semi-final (14:00 GMT) on BBC Two/BBC Sport website, Radio 5 live sports extra; final on BBC Three/BBC website (19:00 GMT); live text commentary on BBC Sport website, mobiles and app. Britain's Andy Murray has been drawn in the same group as Roger Federer for the ATP World Tour Finals in London. Murray, 27, has won three titles in the past six weeks to qualify for the eight-man season-ending tournament, which takes place from 9-16 November. 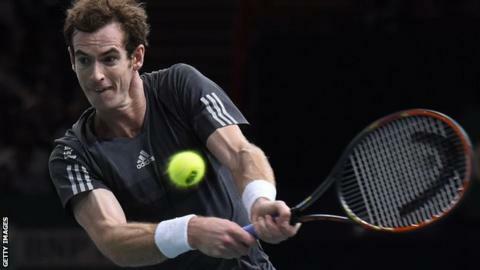 The Scot is in Group B along with Swiss second seed Federer, Japan's Kei Nishikori and Milos Raonic of Canada. Top seed Novak Djokovic, Switzerland's Stan Wawrinka, Czech Tomas Berdych and Marin Cilic of Croatia are in Group A.
Murray will open play at the O2 at 14:00 GMT on Sunday against Nishikori, followed by Federer against Raonic at 20:00. Wawrinka and Berdych begin proceedings on Monday, with Djokovic and Cilic in the evening session. The top two players in each group will progress to the semi-finals, with the standings based initially on match wins, although it can come down to the percentage of games won or even world rankings as the final tie-breaker. Murray has avoided defending champion Djokovic, who beat him at the Paris Masters last week to end his 11-match winning run. But the 2013 Wimbledon champion will face Federer, who is attempting to regain the world number one spot and win this title for a seventh time. "It was always going to be tough for Murray whichever group he was drawn in. Clearly Djokovic is the best player in the world so Murray might prefer not to face him again. But what a year Federer has had - he might even end the year back as world number one. Nishikori has been in tremendous form while Raonic has a winning record against Murray and a big serve." Three-time semi-finalist Murray and Federer have each won 11 of their career meetings. The Briton has a 3-0 winning record against Nishikori but trails Raonic 3-1 in their head-to-head. US Open champion Cilic, meanwhile, will be making his debut in the tournament at the O2 Arena. "It is going to be very difficult but very exciting," he told BBC Radio 5 live. "I hope it is going to be an absolutely amazing experience. "I have watched it on TV for so many years so it is going to be very exciting, especially knowing it's played in front of full crowd, with big entertainment. "Any of the matches could be a Grand Slam final so it is satisfying to play in it." World number three Rafael Nadal will miss the tournament after having appendix surgery on Monday.